One of the food blogs that recently came to my attention is run by Carolyn, a Mom of five kids. 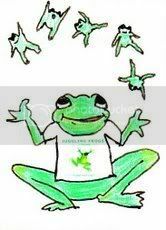 The name of the blog itself, Juggling Frogs, is enough to get your attention. Carolyn, mixes a heady amount of recipes with some personal tidbits. As readers of Help! I Have A Fire In My Kitchen know, I tend to like reading food blogs from "real" people talking about "real" situations and "real" food. Carolyn also has some great pictures of her creations in some of the recipes. You can click over to Juggling Frogs to see the recipe for Recipe for "Donuts "Dunkin-style" (pareve)" that we are presenting here. This recipe is for "fried donuts" (and good for Hanukkah) .However, since @ Help! 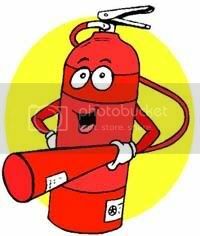 I Have A Fire In My Kitchen, we do not like to divide up processes and place everything in front of you at one time, we are going to do a bit more explaining. Fry in 350º Fahrenheit oil (in a wok) until golden brown. They should be drained on something absorbent, such as paper towels. We like them sprinkled with confection sugar. 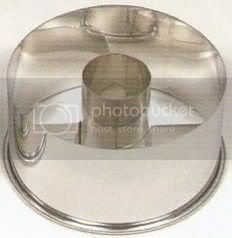 A few years ago I bought a donut cutter - it looks like an upside-down mini bundt pan - that cuts "O" shaped donuts quickly. Before that, we lived very contentedly with an upturned drinking glass and finger-poked-out holes. There are a couple of utensils that will make your life easier here, especially if you make donuts more than a couple of times a year. The first as Carolyn mentions is a donut cutter. 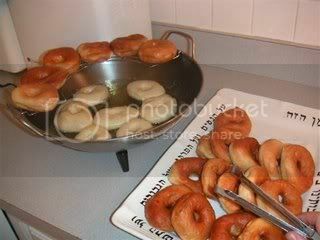 The second is donut pan which you can used if you are baking and not frying your donuts. While the donuts are cooling, combine glaze ingredients – stirring until smooth and then pour it over the donuts. First let me thank Carolyn @ Juggling Frogs for her kind permission to repost this recipe here at Help! I Have A Fire In My Kitchen. This is really easy to make. You can of course make this a full "milk" recipe by changing the soy milk to real milk and the margarine to butter. The glaze is your option of course. Remember though, these are fried and not baked and you do require a bread machine. man these look soooo good!!!! A Few New Blogs....Come And Join The Fun!